Please leave a comment below to be entered in a giveaway. 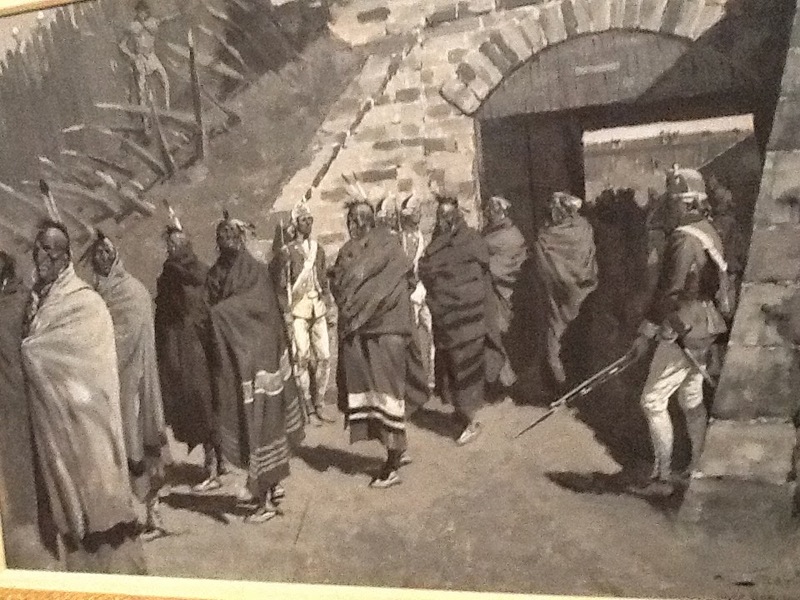 In January 2015, I blogged about Western artist, Charles Marion Russell. 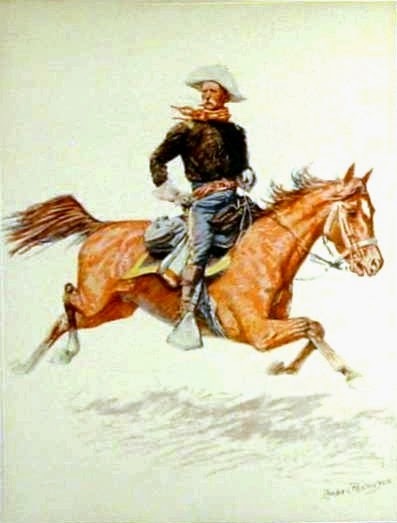 While researching Russell’s story, I found that he was a contemporary of Frederic Remington, another well-known Western artist. I thought I would share Remington’s story with you this month. As we’ll see there were major differences between the two artists, even though there is some similarity in their work. Russell made a living as a cowboy and chose to live in the west for much of his life. Remington tried living in the west, and did get an understanding for the cowboy life, but chose to live back east instead of the more rugged West. Frederic Remington was born in 1861 in Canton, New York. His father attended West Point and served as a Colonel in the Civil War. He had high hopes his only child, Frederic, would follow in his footsteps, but Frederic proved more interested in the arts than in math and other studies necessary to attend West Point. Instead, he practiced drawing cowboys and soldiers from an early age. As he grew older, he often drew caricatures of his classmates. When he attended Yale, his first published drawing was a cartoon of injured football player. In 1879, he left Yale to care for his father who had contracted tuberculosis. After his father’s death, Remington worked a variety of small jobs at newspapers. He once told his uncle he didn’t aspire to fame, but would be content working as a journalist with a sideline in art. At 19, after receiving an inheritance, Remington set out for the wilds of Montana. He considered buying a ranch, or going into mining until he realized his inheritance wouldn't cover the cost. While in the West, he did begin to understand the harsher elements and the nature of the cowboy’s work, something that showed up in his art work. Harper’s Weekly published Remington’s first commercial piece of art, a re-creation of a quick sketch he’d done on some wrapping paper. After numerous ventures that either didn’t pan out, or weren’t what Remington wanted to do, he began to sketch and paint in an attempt to make a living with his art work. His earlier choice of sketching patrons of saloons hadn’t been favored by his wife and she left him. He continued to paint, reunited with his wife and moved back east. At this time, his technique was considered amateur and rough. Remington began studying at the Art Students League of New York. He began to submit sketches to Harper’s Weekly and Colliers. In 1886, at the age of 25, he received his first full page under his own name in Harper’s Weekly. He traveled a lot to various places such as Arizona and Canada, but his big break came when he was commissioned to illustrate a book for Teddy Roosevelt. 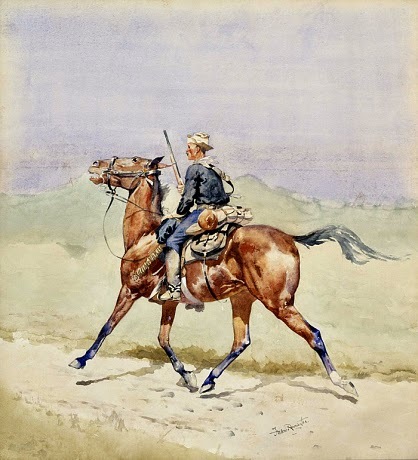 Ranch Life and the Hunting Trail would showcase 83 illustrations by Remington. The book was serialized in The Century Magazine before being published as a book. Remington’s credibility as a Western artist soared as the issues released. Remington received many honors. In 1888, two of his paintings were chosen by the U. S. Postal to be reproduced on stamps. After being dropped by Harper’s Weekly, he wrote and illustrated books about the West. In 1898, he became a war correspondent for the Spanish-American War. At the end of the war, the Rough Riders presented Teddy Roosevelt with Remington’s bronze, The Bronco Buster. Remington declared this to be a great honor. Throughout his life, Remington produced close to 3000 works of art, wrote 8 books and cast 25 bronzes, many of which are popular reproductions today. His study on the horse in motion changed the way horses were depicted in art. 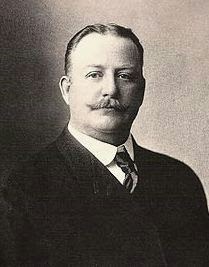 Frederic Remington died young at 48 years old, from complications of appendicitis. 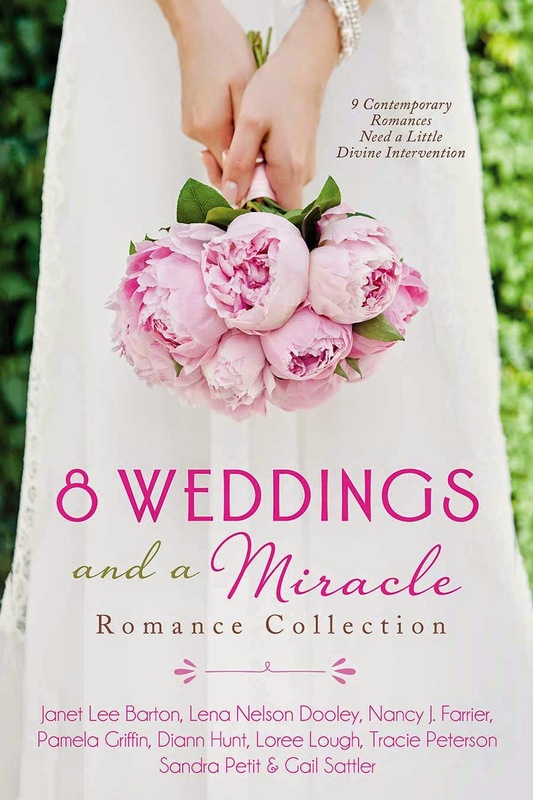 8 Weddings and a Miracle - Weather the storms of life alongside nine modern couples who hope to make it to the altar—someday. Be it a meeting in the wrong place at the right time, an accident that opens hardened hearts, or weather that seems to blow things off course, sometimes love needs a little divine intervention. 8 Weddings and a Miracle includes my novella, Wall of Stone, a story set in contemporary England. Love his paintings. I'd never heard of him. So sad he died so young. Thanks for sharing, Nancy. Thank you, Debbie. Glad you enjoyed the post. Remington was truly a talented artist. I really enjoy is bronzes. Thank you for sharing, Nancy! Melanie, I love his bronzes. Thank you for commenting. Nancy, We are fortunate to have the Gilcrease Museum in the town I live in. It has the world's largest collection of western art, including many of Russell's and Remignton's work. I've been a fan of both men for many years. Thanks for helping me to learn more about them. Vickie, I would love to visit that museum. Thank you for commenting. I enjoyed learning about both of these artists! I think I need to visit the Eiteljorg Museum again, they have works by both artists. 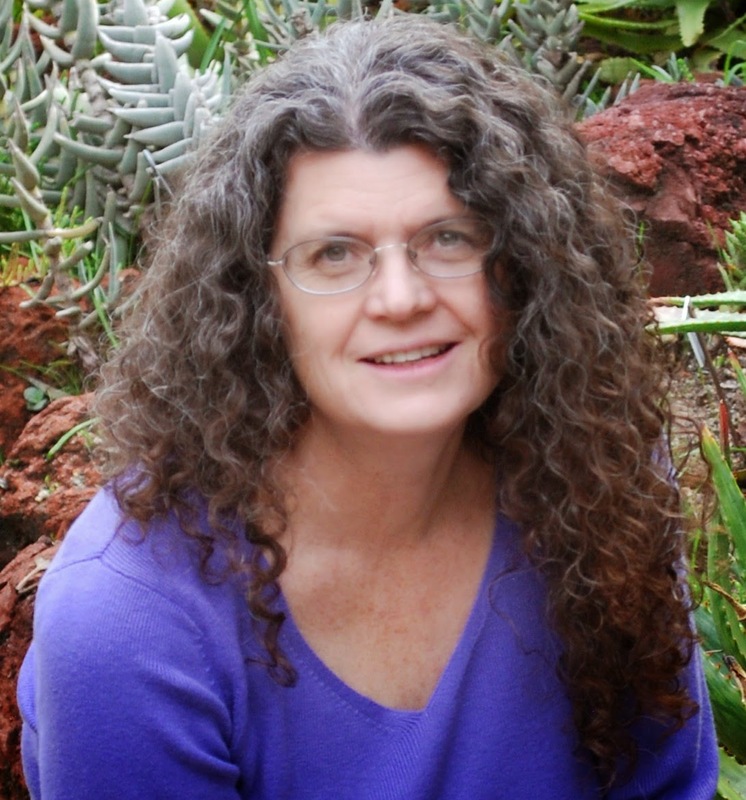 Linda, when I was in Indiana visiting my sister last November, she took me to teh Eiteljorg Museum. That's where I got the idea for these two blog posts. I loved the Eiteljorg and hope to go again sometime. Thanks for commenting. Thank you for commenting, Sharon. I loved that he was noted for incorporating true motion in his horses. I didn't know he was an author. I haven't seen any of his artwork personally but have seen photos of the bronzework. Connie, my brother-in-law received Remington's book, Ranch Life and Hunting for Christmas and really enjoyed it. I haven't read any of his books, but maybe I should. Thanks for commenting. Great point, Donna. Thanks for commenting. 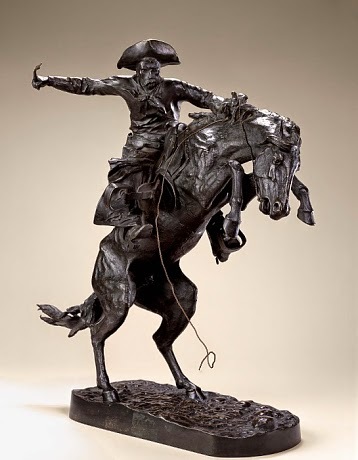 I have seen pictures of Remington's art and love his bronzes. I didn't realize he was also an author. Thanks so much for the interesting post, Nancy!